Poetry and eBooks have never played well together because, for instance, fixed line lengths don’t jive with the reader’s ability to adjust type size (poetry is too rigid). There are, of course, some clunky workarounds, like including a note for users to match their settings so that the longest line in the book is unbroken. Certainly this doesn’t have to be an issue; it’s something an HTML5 developer could solve quickly, I think—but why should they? Limitations drive ingenuity. I’ve often wondered if, say, no one figured out how to make cars, would something else have been invented? Antimatter transportation! Tommy Pico, who does Birdsong, released what he calls the first poetry App (for iOS and tablets) yesterday. 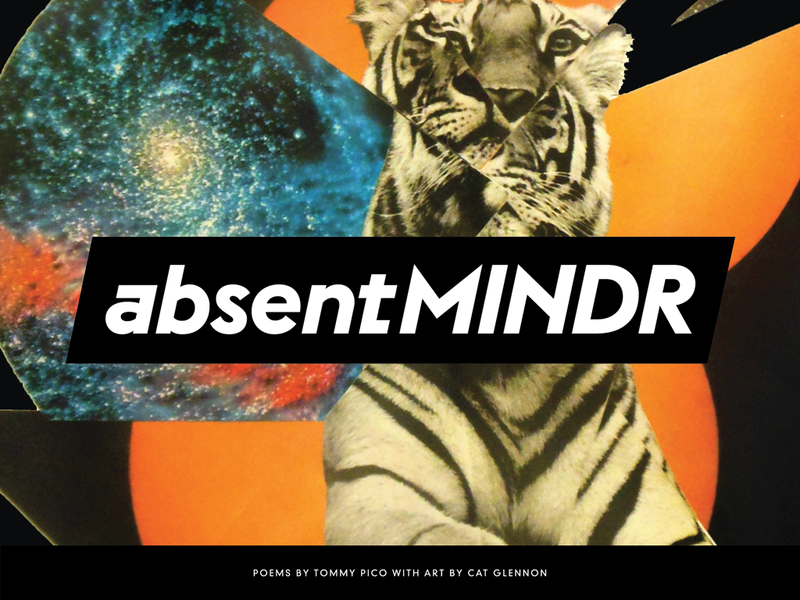 Called Absent Mindr, it’s a “ch-app” he says—of course it is!—with 24 poems in four sections, situated alongside audio playback of him reading the poems, and bright collages by Cat Glennon. The poetry is cool. That’s first. I really appreciate that the literature isn’t secondary to techcrunches, and the press release for this app is all about the poetry. Certainly it’s good stuff (read “Inheritance” at Best American Poetry), and Tommy “Teebs” Pico’s voice is pitch perfect on the audio (which can be listened to when you’re not connected, like on the subway, because all the content is a download), but what I’m really impressed by and excited about is the presentation, which is slick and gorgeous. It’s antimatter transportation to cars. The app considers the poetry, the art matches the tone. Books rarely match content with UX this well. I think apps are expensive to create, whereas eBooks are free—but Absent Mindr suggests there’s a good future for presenting poetry this way. As startups like Atavist, Byliner, Oyster, Zola, Wattpad, Readmill (RIP) and Medium etc explore how to monetize this new frontier, it will be interesting to see what DIY pioneers like Tommy Pico create in the margins. Anecdotally, I got my hands on the app just a day before I went to NYC for the Chapbook Festival. He did a good job spreading the word, because the room was abuzz about it (ie. three or four people mentioned the app to me while I was there). Chapbooks are a space traditionally reserved for handmade, crafty, papery books that fold, but they are open to sweet new fields like—may I suggest—chappbooks.